This collection of 9 individually wrapped brownie ornaments is packaged in a clear acetate box and tied with a holiday ribbon. 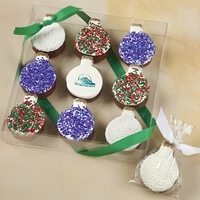 Each brownie is dipped in chocolate and decorated with seasonal sanding sugar, sprinkles, or crystals. For orders of 12 packages or more, we are happy to include an ornament with your company logo or your personalized holiday message at no extra charge.